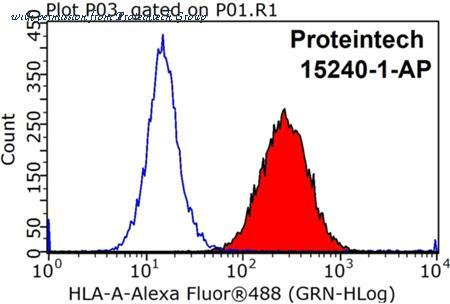 The HLA class I (HLA-A) antibody from Proteintech is a mouse monoclonal antibody to a fusion protein of human HLA class I (HLA-A). This antibody recognizes human, pig antigen. The HLA class I (HLA-A) antibody has been validated for the following applications: ELISA, FC, IHC, WB analysis. 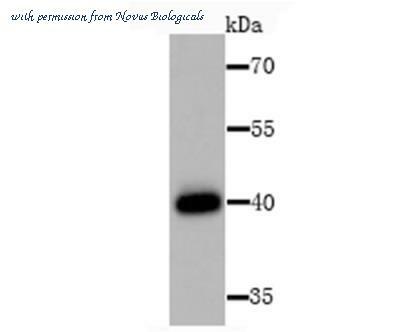 The HLA-A antibody from Proteintech is a rabbit polyclonal antibody to a peptide of human HLA-A. This antibody recognizes human antigen. 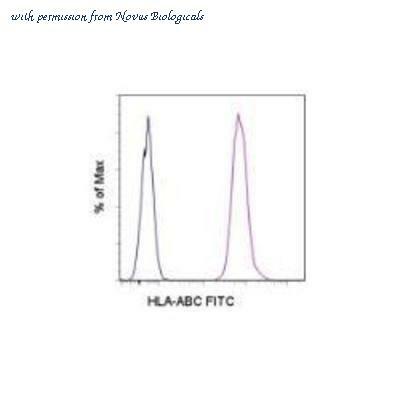 The HLA-A antibody has been validated for the following applications: ELISA, WB, IHC analysis. Detection of HLA Class I in Human Blood Lymphocytes by Flow Cytometry. 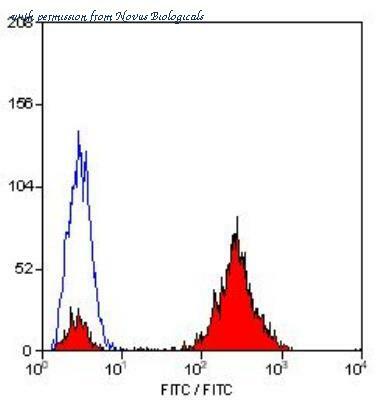 Human peripheral blood lymphocytes were stained with Mouse Anti-Human HLA Class I Monoclonal Antibody (Catalog # MAB7098, filled histogram) or isotype control antibody (Catalog # MAB003, open histogram), followed by Phycoerythrin-conjugated Anti-Mouse IgG Secondary Antibody (Catalog # F0102B ). 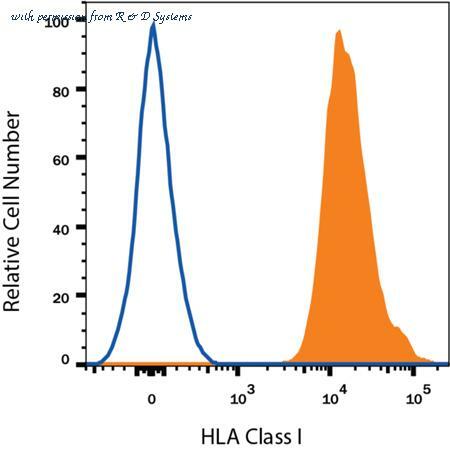 Detection of HLA Class I in Human Blood Lymphocytes by Flow Cytometry. 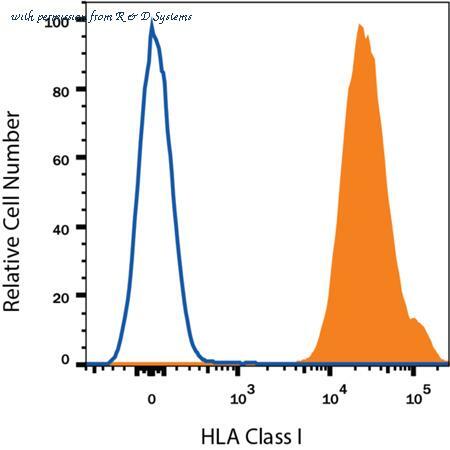 Human peripheral blood lymphocytes were stained with Mouse Anti-Human HLA Class I APC-conjugated Monoclonal Antibody (Catalog # FAB7098A, filled histogram) or isotype control antibody (Catalog # IC003A, open histogram). View our protocol for Staining Membrane-associated Proteins . Detection of HLA Class I in Human Blood Lymphocytes by Flow Cytometry. 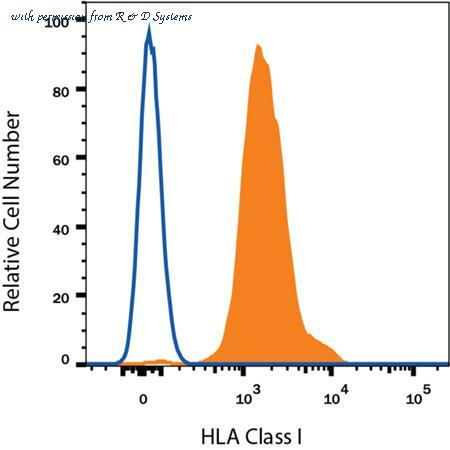 Human peripheral blood lymphocytes were stained with Mouse Anti-Human HLA Class I PerCP-conjugated Monoclonal Antibody (Catalog # FAB7098C, filled histogram) or isotype control antibody (Catalog # IC003C, open histogram). View our protocol for Staining Membrane-associated Proteins . 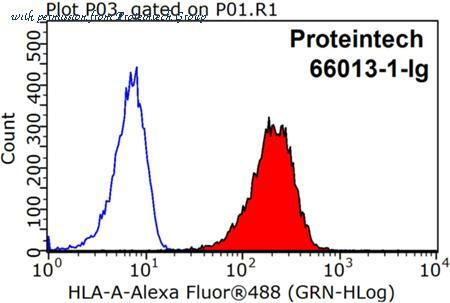 Flow Cytometry: HLA ABC Antibody (W6/32) [NB100-64775] - Staining of human peripheral blood lymphocytes with Mouse anti Human HLA ABC:Alexa Fluor 647. Flow Cytometry: HLA ABC Antibody (W6/32) [NB100-64775] - Staining of human peripheral blood lymphocytes with Mouse anti Human HLA ABC. 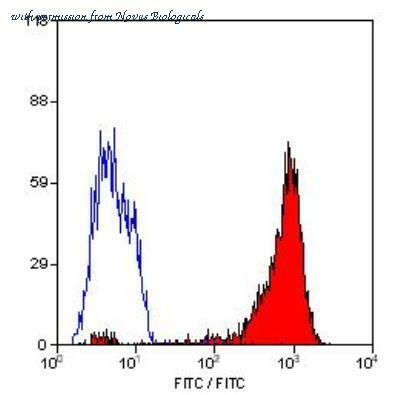 Flow Cytometry: HLA ABC Antibody (W6/32) [NB100-64775] - Staining of human peripheral blood lymphocytes with Mouse anti Human HLA ABC:FITC. Immunohistochemical staining of human lung carcinoma tissue using HLA Class 1 ABC antibody. 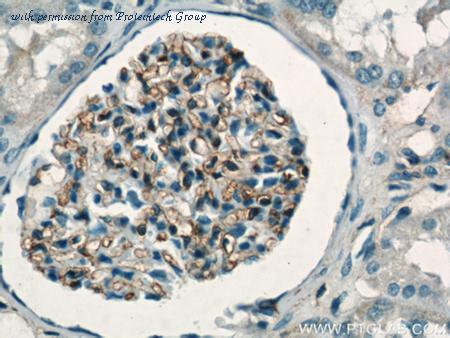 Immunohistochemical staining of Human Liver Cancer tissue using HLA Class 1 ABC antibody. Immunohistochemical staining of human lung carcinoma tissue using HLA A2 antibody. Immunohistochemical staining of Human Liver Cancer tissue using HLA A2 antibody.